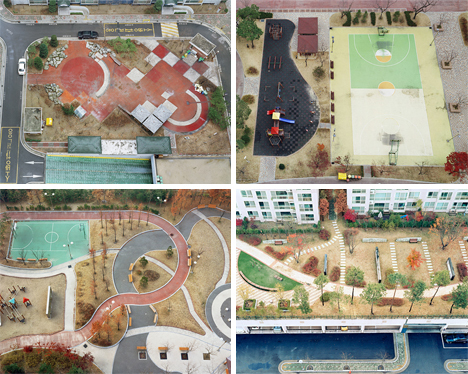 Aerial views of our surroundings often give us surprising insights into the world we live in. Who hasn’t ridden in an airplane and marveled at the unexpected shapes of city grids and their countryside counterparts? 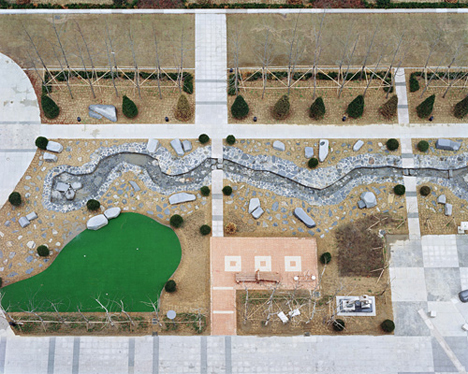 Seoul, Korea photographer Hosang Park uses photography from above to create unique and compelling views of Korean parks and public spaces. They’ve been compared to circuit boards, and it’s easy to see why: each element looks carefully laid out and very deliberately placed. 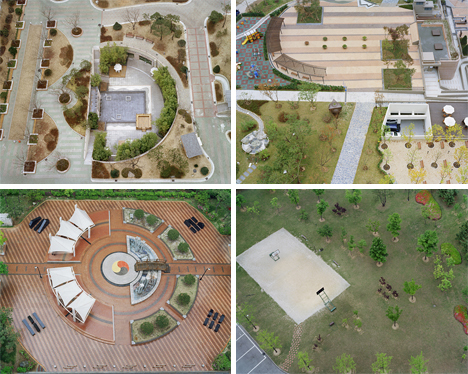 Hosang Park began taking pictures of the public spaces from the upper floors of surrounding high-rises in 2004. 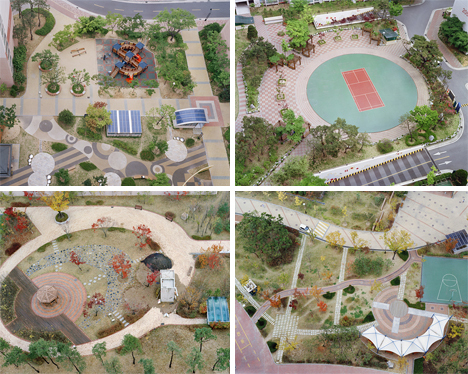 The parks, undoubtedly meant to be welcoming, comfortable places for families to gather, look stark and barren from above. Because of the angle of the photographs, their inorganic planned nature is apparent. Any sense of depth is erased by the angle and field of the photographs, leading the viewer to see public spaces that are surprisingly akin to abstract geometric paintings. The lack of organic feeling in these spaces adds fuel to the idea that they represent real-life circuit boards. It almost makes you wonder if the resemblance to electronics parts was intentional on the part of the city planners. Either way, it seems obvious that the planners were striving for a futuristic utopian setting…but based on the lack of people enjoying these outdoor spaces, it’s safe to say that they aren’t quite the urban paradises they were planned to be. According to the artist, his intention was to shed light on “the stark realities of democracy” in Korea – in a funny way. And because he took care to simply present the spaces instead of telling their story, he does make it easy for viewers to reach their own conclusions about the photographs. The collection, called A Square, was recently exhibited in New York, the photographer’s first solo U.S. show.